Teaching children to be kind to each other. N.G.K. 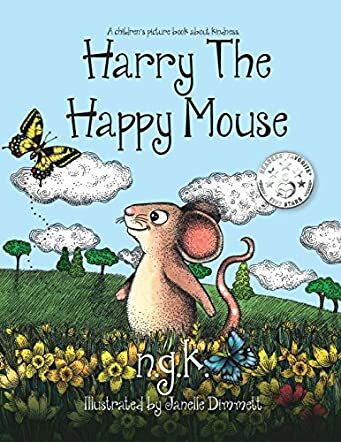 is the bestselling children's picture book author whose first book 'Harry The Happy Mouse' has featured on the Amazon bestseller lists in Paperback and eBook. N.G.K. has worked with Janelle Dimmett to produce what has been called "a future classic". Used in schools acorss the world, Harry The Happy Mouse promotes 'Pay It Forward', teaching children about kindness. N.G.K. 's second book "Harry The Christmas Mouse" has reached number one in the UK and USA Kindle charts. Harry The Christmas Mouse is also available in Hardback and Paperback. The Harry The Happy Mouse Activity book is also available. The story has a lovely message for young readers and I like the rhyming couplets which give good movement and fluidity to the tale. The illustrations are wonderful and they bring all the characters and scenes to life. The chain of helping others and being happy has been created well by the author and it is a good story to encourage children to be kind and helpful to others. Stories like this have a beneficial impact on young readers. This uplifting story can be used for read aloud and interactive sessions in classrooms and also makes a charming read for bedtime story-telling, as it will not only teach children to do good things for others, but will also put a smile on their faces. We love this book, read it every night at bedtime for over a year!